With the blinds at $300 to $600, Elezra opened for $1,500 with 5-2 on the button. Cunningham folded out of the small blind, and Harmon called out of the big blind with A-4. The flop came down K-5-2, Harmon checked and Elezra bet $1,500 into the $3,300 pot with his two pair. Harmon studied a moment and called with her belly-buster straight draw. The turn card was an ace, Harmon checked, Elezra bet $5,000 (into $6,300) and, after a long study, Harmon called. As I watched the action, I noticed that Elezra kept his head down and then threw out the $5,000 quickly after Harmon checked to him. 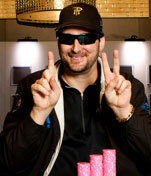 The last card was an eight, Harmon checked and Elezra bet $5,000 into the $16,300 pot. Let’s take a closer look at this hand. First of all, I would like to see Elezra open for more than $1,500 before the flop. I guess that I would like to see him fold the 5-2 before the flop, but it was a button raise, so OK. But if you decide to play that hand in that position, then try to win the pot before the flop by opening anywhere from $1,800 to $2,200. It is too easy for someone to call $900 more, and you don’t want to look at a flop with that hand versus almost any two random cards. I like Harmon’s call before the flop with A-4. On the flop, I like Elezra’s $1,500 bet into the $3,300 pot. Too often players bet too much money when they hit a strong hand that drives their opponents out of the pot, and then they miss the chance to get some value out of a strong hand. In this case, the $1,500 bet is like the bait on a hook. Harmon’s $1,500 call on the flop was natural and easy to make. I mean, she has a straight draw, and an ace draw; but more importantly, ace high was a favorite to be the best hand. On the turn, I like Elezra’s $5,000 bet into the $6,300 pot. With a board of A-K-5-2, why give someone a cheap card to beat you? Harmon’s $5,000 call was natural, but as I watch the tape, I believe she thought that Elezra had some sort of reasonably strong hand. Even still, reasonably strong could easily have meant a pair of kings like a K-J, a K-10 or something similar, which she had beat with her aces. On the river, I love Elezra’s $5,000 bet into the $16,300 pot. He made it really easy for her to call by making such a relatively small bet. In fact, Harmon called $5,000 with a chance to win $21,300, which means that the pot was laying her over four-to-one. Thus, she had to be more than 80 percent sure that she was beat in order to fold. So, on the surface, it was an easy call. But again, I believe that Harmon convinced herself that Elezra was strong. Her long hesitation and general demeanor told me that she read Elezra as being really strong. Was Harmon right when she said, “I could have easily folded that hand”? Well, actually, in her case, yes. But to the rest of the world it was an easy, automatic call.